Another glorious February weekend, and I was off, once again, to the field with my research students. On this trip we returned to the Falls of the Nottoway River to obtain more measurements and complete our mapping of this awesome exposure in the middle the Southside Virginia Piedmont. 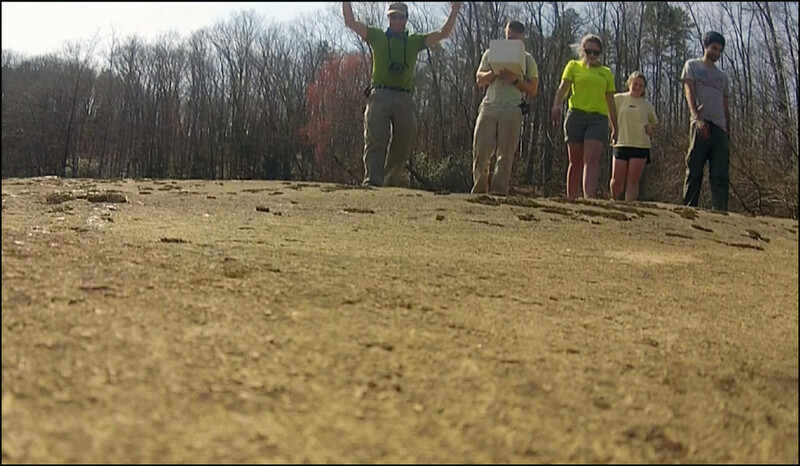 We brought a small friend with us, a quadcopter that we dispatched to take low-elevation aerial imagery of the outcrop. Warren Kirkwood smartly piloted the quadcopter, and Mark Simonds controlled the camera. Caroline Abbott, Katie Lang, and Tom Vinci rounded out the team. The perspective from above is eye-opening. Oblique aerial view to the east-northeast of the big outcrop at the Falls of the Nottoway. Members of the William & Mary Structural Geology and Tectonics research group for scale. Click on the picture to see the full size image. Our aerial adventure lasted all of 8 minutes. We took both still images and video that will be used to help complete the geologic map of the upper part of the outcrop. My students are presenting a poster on their research at the 2017 Geological Society of America Southeastern section meeting next month. Read their abstract. 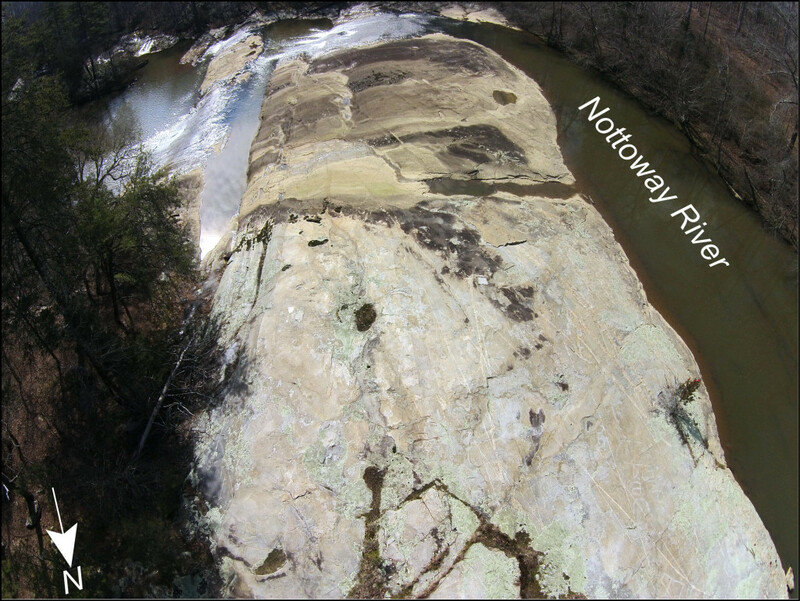 Oblique aerial view to the south of the uppermost outcrop at the Falls of the Nottoway, Virginia. 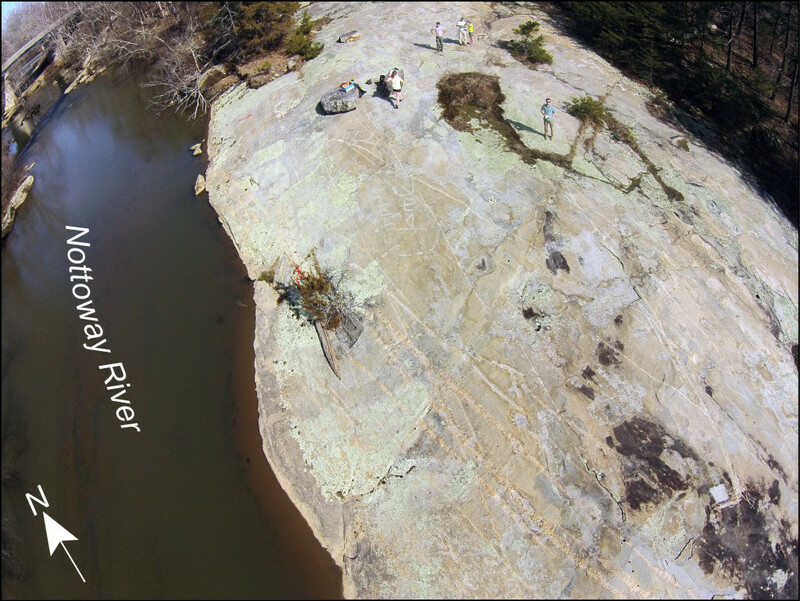 At high water conditions, the Nottoway River flows over the top 1/3 of the outcrop, which is stained with a patina of iron and manganese oxides as well as a thin coating of sediment. In the upper part of the outcrop (the foreground) the granitic gneiss is rarely covered by water and the bedrock is better exposed. Click on the picture to see the full size image. Special thanks to Physics Professor Bill Cooke, who not only loaned us the quadcopter, but offered free flying lessons to my students. 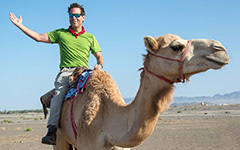 For earth scientists, the research applications from low-elevation aerial imagery are numerous. We are looking forward to more aerial adventures in the near future as we map earth structures and document landscape change. The consulting world is using UAVs/drones/quadcopters more and more frequently for many types of innovative projects. Your students’ experience with this has the potential to serve them well after graduation! If any were really into it, I’d encourage them to look into piloting licenses as the ability to fly one of these things legally (i.e. not just ‘recreationally’) is definitely a marketable skill.